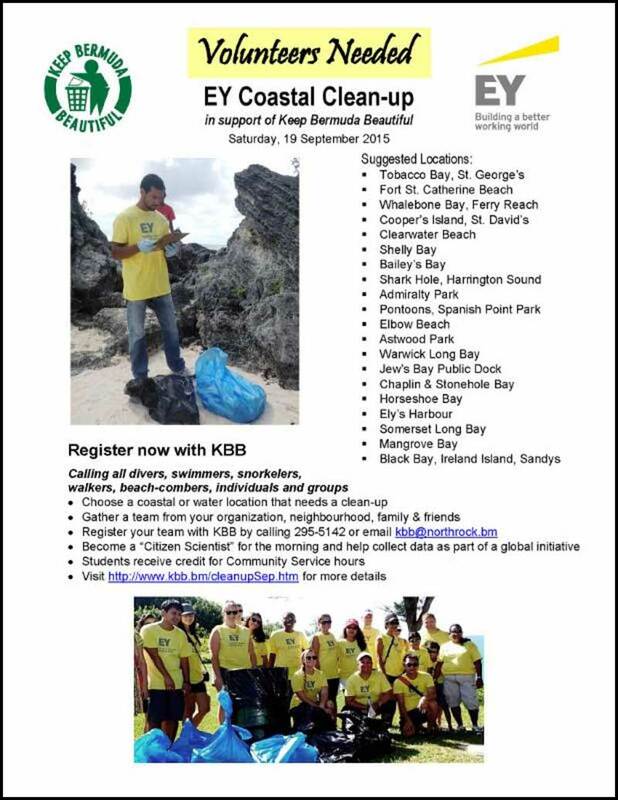 The EY Coastal Clean-up in support of Keep Bermuda Beautiful [KBB] will be on Saturday, September 19th, 2015. The annual island-wide event gives volunteers an opportunity to enjoy combing the beach for the morning, or snorkeling or diving underwater in an effort to remove litter and marine debris and maintain Bermuda’s beaches and coastline known for being pristine. Volunteers are being asked to register for the event through KBB’s website or call 295-5142. Participants who join the EY Coastal Clean-up will be part of a global effort to help reduce ocean pollution. It is the 30th International Coastal Cleanup and people will be participating in similar clean-ups on the same day all around the world. Participants are asked to be “citizen scientists” for the day and not only clean up but categorize and tally each piece of litter on a data collection card. The information from the data cards is collated by KBB and then sent on to Ocean Conservancy’s headquarters in Washington, D.C. In 2014, Ocean Conservancy reported that 91 countries participated and more than 560,000 volunteers picked up over 16 million pounds of trash worldwide. Bermuda’s results for the 2014 EY Coastal Clean-up showed that 484 people in 31 locations picked up more than 9,000 pounds of debris from Bermuda’s shoreline. Anne Hyde, KBB Executive Director says, “More people are becoming aware the problems of trash and ocean pollution and want to do something about it. It is easy to join the EY Coastal Clean-up. Simply gather a team of family, friends and colleagues. Select a location or ask KBB to assist with selecting a location. Register your team by calling 295-5142 or register at www.kbb.bm. 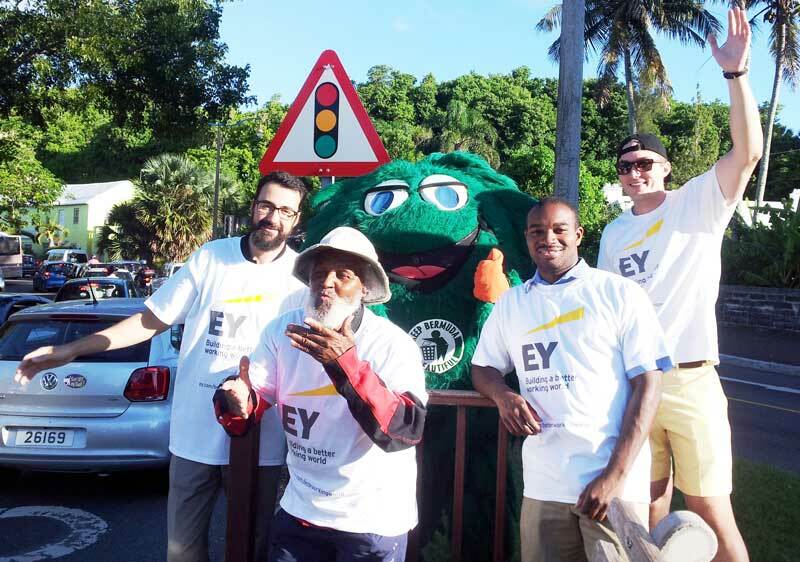 The EY Coastal Clean-up will be kicked off at EY’s offices on Bermudiana Road with a visit from KBB’s mascot, the Litter Critter, and followed by a promotional wave with Johnny Barnes. EY are the title sponsor of the event and will participate with employee teams at Tobacco Bay, Church Bay and Malabar Coastline. Billed as an event for everyone, corporate organizations, sports and civic groups, students, families and neighbours are encouraged to sign up. Students can earn credit for community service. Participants will be provided with event t-shirts, trash bags, blue recycling bags, disposable gloves, data collection cards and instructions. Volunteers are asked to bring along their own re-usable drink container this year and the team leaders will provide a cooler and ice to keep drinks cold. With the cooperation of the Parks Department Waste Collection teams and assisted by a few Bermuda Regiment trucks, the collected debris will be trucked away.